LOVE BEING A NONNY! 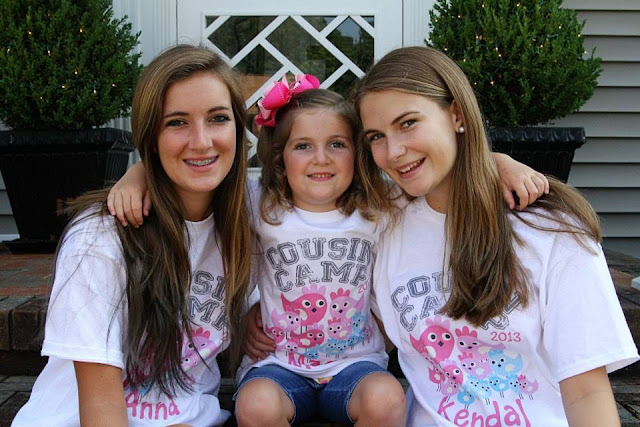 : Cousin Camp Recap! I have had several people email me and ask for the details of Cousin Camp. So, I thought I would put the details in one post. I always begin with an email sometime around January with the dates I have chosen. We tweak those dates until we come up with two days that suit every family. We have done it now for four years and so far it has worked....probably because we pin the date down early. And also because most of the cousins are still young enough that their schedules are their mom's schedules too! The moms always think I am a little crazy and over the top when they get that email so early, but that's what it takes to make it work. This was the shirt I chose for this year. The blue birds represent the boys and the pink...the girls. I always rent a bouncy house/slide from a local company. I try to get this reserved about six weeks before camp. I usually do a follow up call the week before to make sure we are all on the same page. We have various ones every year. This is a picture of the cow we had a couple of years ago. For the last couple of years, we have taken a golf cart ride through our neighborhood. We live in a neighborhood that we feel like we can do that safely in. We go so slow that the moms walk behind us for safety. We hold tight to the little ones and don't let them sit alone since they don't have helmets on. The kids (young and old seem to like this) and it's fun for Nonny and Poppy too. It goes without saying there is NO way I could do this without Poppy. He works for weeks to get everything ready! We spend most of our time the first day in the back yard at our house. We blow up four or more baby pools and we have a play house, playset with swings and various baby swings. We also have riding toys/bikes they can ride on on the driveway. The second day is spent at the pool. This is always a big feat to get all the kids in the bathing suits and get them all to the pool. It's worth it in the long run though and so far we have continued doing it. We eat lunch at the pool too and always try to get a group shot before we leave. I'll be honest....the hardest part is the food. Most of my family members eat very healthy. They try to keep their children away from fast food and dyes. We don't eat completely healthy at Cousin Camp and that's ok, but it is hard to serve prepared, quick foods of any kind to that many children. Lunch the first day is a Chick-Fil-A Nugget tray, fresh fruit, chips and salsa. Dinner is pizza. We have various snacks throughout the afternoon and evening. Breakfast is pastries and fresh fruit, yogurt, milk and orange juice. For lunch each mom orders for their kids off the menu at the pool. We make it all work and they are all gracious and understand the dynamics of feeding twelve little ones under seven! We had a backup plan this year in case of rain....The Children's Museum. We didn't have rain, sans a thunderstorm after dinner, so we didn't have to use our backup plan! The sleeping arrangements are interesting...to say the least. That's a lot of cribs and Pack N Plays. Again, we make it work but I think next year some of the four, five, six and seven year olds may all sleep together in the playroom instead of with their moms. They will love that! I'm sure I have left some things out. If you have any questions, please feel free to ask here in comments or email me. Already looking forward to Cousin Camp 2014. We will have at least one more baby to add to the group.....that baby's gender will be announced next week! A shout out to my mom and dad who were so much help!!! And to my baby sister and her big girls for all their help! It really does take a village to have a Cousin Camp! Thank you for sharing! I think cousin camp sounds so awesome! I definitely want to feature this in TNH soon. You are very inspiring!!!! What a great idea! What beautiful pictures! You certainly inspired me today. Thanks so much for sharing. Making memories that these little ones will never forget! So thankful that your Dad and I are able to be a part of this legacy.